Striking out on the seventh Agatha Raisin mystery in the series, we have a downtrodden Agatha, upset by her ex-fiancé’s continued coldness and her importune affair with a younger man. Attempting to come back down to earth, recapture the wayward James’ attention, and distract herself from mental turmoil, Agatha determines to once again enter village life, only to be endlessly bored. When the Wellspring in nearby Ancombe becomes the center of dispute, Agatha inadvertently discovers a body seeping blood into the mineral water. In a move of determination to irritate people, Agatha takes up a job representing the new water company who wishes to use the spring water. How can she make murder into profit? Exasperated with James, Agatha starts to sleuth on her own as she maintains a successful PR campaign, only to fall prey to yet another stunning young man. Between murder, mystery, and romance, Agatha confronts the pains of growing older and the perceptions of those around her. Following on the heels of Agatha Raisin and the Terrible Tourist the exoticism of travel and escapism are replaced by a somewhat humdrum village quibble, similar to the focus of my least favorite Agatha Adventure, The Walkers of Dembly. The angst over a company selling Ancombe water is hardly a driving focus of interest for readers. Yet, M.C. Beaton keeps this weaker mystery entertaining through the persona of Agatha herself. Her personal interactions with James, a new lover, and the ever amusing Roy Silver are more than enough to keep readers engaged. Agatha’s waxing and waning strength provides some emotional turmoil as does her determination to progress forward without James and her inability to do so. Here, Agatha’s age proves the central crises point in her life. She has difficulty growing older while at the same time desiring a certain stability that enables her to accept herself just the way she is. It’s engaging and while the mystery remains lackluster, and the characters easily intermingled, readers hardly care because we get some more Agatha time! Agatha’s cozy Cotswold life, her friendship with Bill and Mrs. Bloxby, her cuddly cats, and more keep the cozy cranking. Even Agatha’s emotional turmoil, in a manner, keeps the atmosphere alive in that she becomes even more real and readers want to be integrated in every moment of her life. As I’ve already mentioned, however, the mystery is weaker. The debate over the water company using Ancombe water doesn’t grab readers and the cast of suspects are easily confused. How could someone really have motive to murder over something so trivial? If they did, do readers truly care enough to stay with the investigation? For Agatha’s sake, yes. For the mystery’s sake – not really. But not all is ho-hum in mystery land. 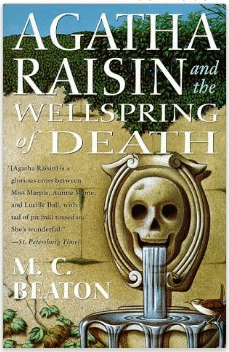 The conclusion in The Wellspring of Death breaks with the normal confrontational style of killer and danger by adding some new, and quite unexpected spice into the plot that will greatly affect Agatha and friends from her forward. While the evil doer is evident fairly early, the manner of confrontation and the stakes are not. Readers won’t be disappointed. In a spring, cozy-mystery, reconnecting with old friends mood, I picked up Agatha Raisin and the Wellspring of Death in audio book formatting from my local library. The version I listened to is the older one read by Donada Peters, the original narrator for this audio series. As usual, she captures Agatha’s voice, her prickly nature, her hilarious sensitivity, and her stunning vulnerability. That being said – good luck getting this version from anywhere (except a library with evidently old stock). 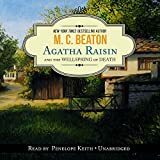 The newer releases of the audiobook are recorded by Penelope Keith; I have also listened to some of the Agatha audio books as narrated by her and as much as I adore Peter’s elegant reading, Keith’s narration remains my favorite. In other words, regardless of which audio version you have (or check out) both versions are sure to delight. Listening to Agatha Raisin increases the coziness and makes for the perfect spring commute to work!